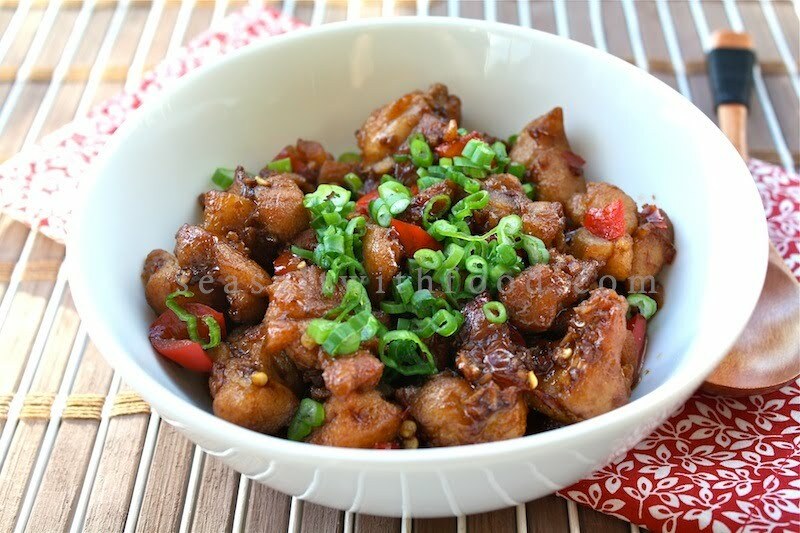 This is the 3rd and the last recipe using the salted chilies for my Hunan recipes series. I have tweaked this particular dish a few times. The original recipe from the cookbook wasn’t what I had envisaged. The meat turned out too dry and bland. So, here is my version of Fragrant and Hot Chicken recipe. My family enjoyed this dish very much. I think you will like it too. Do try the recipe and please send your feedback. Thanks. Cut the chicken into bite-size cubes. 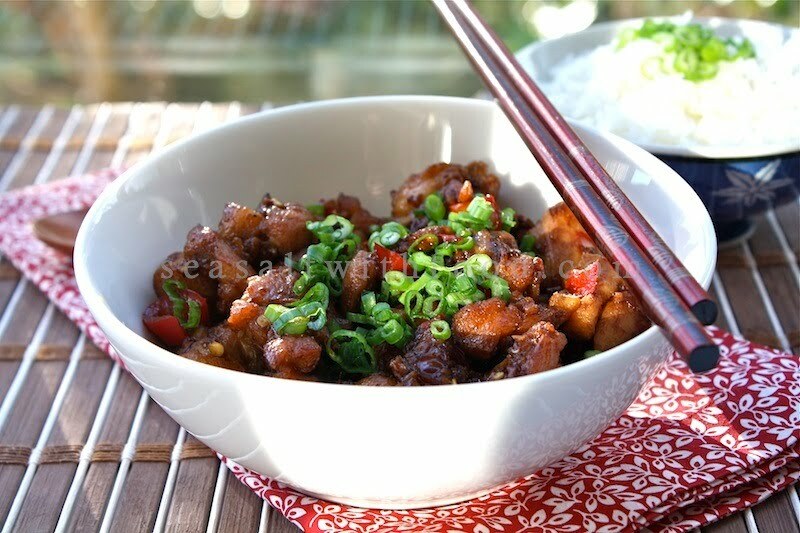 Place the chicken cubes in a bowl and marinate with soy sauce and wine. Heat enough oil for deep-frying in the wok over high heat. Fry the chicken pieces until golden in color. Remove the chicken with a slotted spoon and set aside. Pour off all but 3 Tbsp of the oil, and return the wok to a medium heat. Add the ginger, garlic, chili bean paste, and chopped salted chilies and stir-fry until the oil is fragrant. Add the water and dark soy sauce and bring to a boil. Mix in the chicken pieces and then cook over a high heat to reduce the sauce, stirring constantly. Season the chicken with salt, if necessary. Serve immediately with some scallions. This looks delicious! 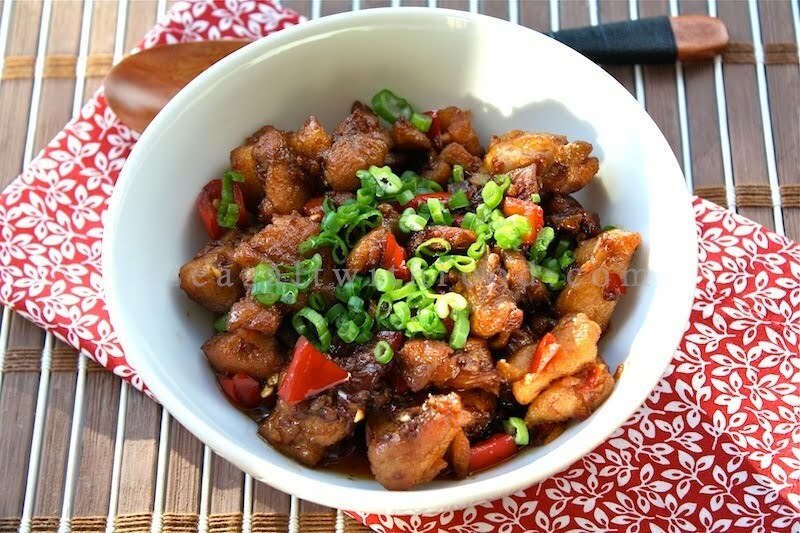 I already had plans to make those chopped salted chilies, but now I've got to get them going sooner so I can make this chicken. Looks like a perfect way to introduce them into my cooking.